I watched Amazing Race Asia 2 last Thursday. The race started in Singapore and finished at a pit stop in a non-elimination leg of the race in Manila, Philippines. Sisters Vanessa and Pamela from Malaysia were the first to arrive. And they both got the prices for Leg 1, Nokia N95 and N73 mobile phones. Second, was our Team Philippines Best Buddies Marc and Rovilson. The other team Philippines married Terri and Henry came 9th place. And the last one to arrive were dating Edwin and Monica from Hong Kong. I was laughing of the "balut" eating scene. Some liked it and some were puking and gurgling. I know the feeling because I never really liked balut. I know they're healthy food but I just don't have the stomach to eat the head and the feathers. ewww! 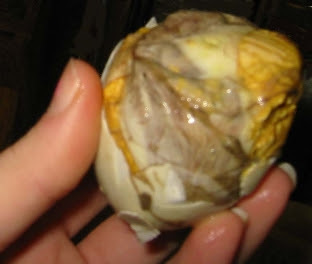 hehehe... And for those who don't have any idea of what I'm talking about, here's a balut looks like. A Balut is a fertilized duck (or chicken) egg with a nearly-developed embryo inside that is boiled alive and eaten in the shell. They are considered delicacies here in the Philippines. Popularly believed to be an aphrodisiac and considered a high-protein, hearty snack, balut are mostly sold by street vendors at night in the regions where they are available. They are often served with beer.